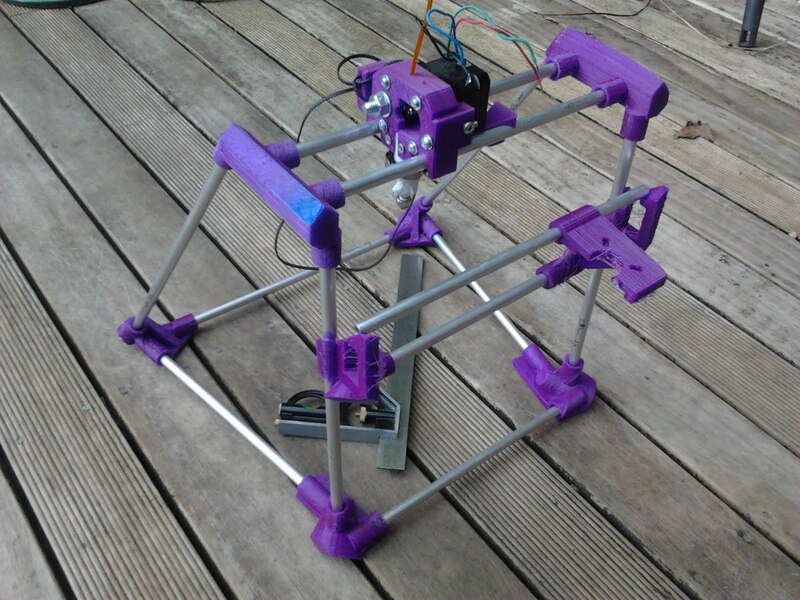 Above is an Orca-style RepRap frame using 10.8mm round extruded aluminium tube simply whacked into printed sockets with a large mallet. The result is slightly under tension on the back bracing which holds the whole thing very securely together with no fasteners. This is much lighter and simpler than traditional prototyping-style construction with adjustable threaded rods all over. It has the benefit that the smooth rods can be used as axis guides as well as support structure. The Orca-style dihedral distributes load and prevents swaying from side to side. It's crowned with a one-piece extruder that includes all the guides, clamps and sliders in a single printed piece. It could still be easier to assemble though. So the build plate is going to be moving in the Z axis or is that a temporary spot for the extruder? The Y build bed will be pushed up and down on the Z, yes. The extruder is going to live there - I'm printing the adapted bracketry now. So does the bed go above the two horizontal bars? Initially I pictured the bed between them, but realized that when the bed moves along Y anything on the bed would be scraped off if that were the case. (facepalm) Can't believe I hadn't seen the Orca RepRap yet. Yep - y-axis above the bars. So is this the next gen of your nutless mendel, or are you still hacking on the other one too? Nice design, easy to scale up and down. PLA runs smoothly on the Alu bars then? Hey eD, I'll be in the UK over Xmas and maybe a bit longer. Catch up, eh? I've been thinking for awhile that the z axis could be entirely mechanical and triggered to rise and fall by the extruder's motion somewhere outside the build area. Is your plan as controversial as that?